The Rev. 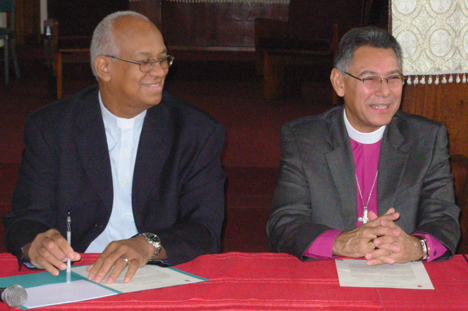 Rafael Moreno Rivas (left) was elected bishop of the Methodist Church of Puerto Rico, succeeding Bishop Juan A. Vera (right), whose term expires Jan. 1. A UMNS photo courtesy of the Methodist Church of Puerto Rico. A clergyman who is also a trained musician will be the next spiritual leader of the Methodist Church of Puerto Rico. The Rev. Rafael Moreno Rivas, pastor of the University Methodist Church in Rio Piedras since 2000, was elected bishop Nov. 14 at a special session of the church’s General Conference. He will take office on Jan. 1, when the term of Bishop Juan A. Vera expires. Bishops in the Puerto Rican Methodist Church serve six-year terms. Moreno was raised in Santurce. In his biography, he describes himself as a little boy as “tall, skinny, and black.” He grew up in a Methodist home and showed early ability in music. He worked nine years as a music teacher and was ordained as a Methodist deacon in 1978 and as an elder in 1981. The autonomous Methodist Church of Puerto Rico traces its roots to missionaries from the United States around 1900. It was for many years linked to what is today the United Methodist Church, becoming fully autonomous in 1992. The church has some 12,000 members and 170 pastors. It is a member of the World Council of Churches and continues strong fraternal relations with the United Methodist Board of Global Ministries. The new bishop was the pastor of eight congregations in the years between 1978 and today. He served as a delegate to the United Methodist General Conference prior to autonomy, and was a district superintendent from 1992-1998. Moreno attended the University of Puerto Rico in Rio Piedras and the Music Conservatory of Puerto Rico, receiving a degree in vocal performance in 1974. He has a master’s degree in music education from the University of Illinois and graduated from the Christian Theological Seminary in Puerto Rico in 1980. *Wright is the information officer of the United Methodist Board of Global Ministries.